A beautiful braided challah is always a classic, but sometimes it's fun to break out a new shape for a special occasion. 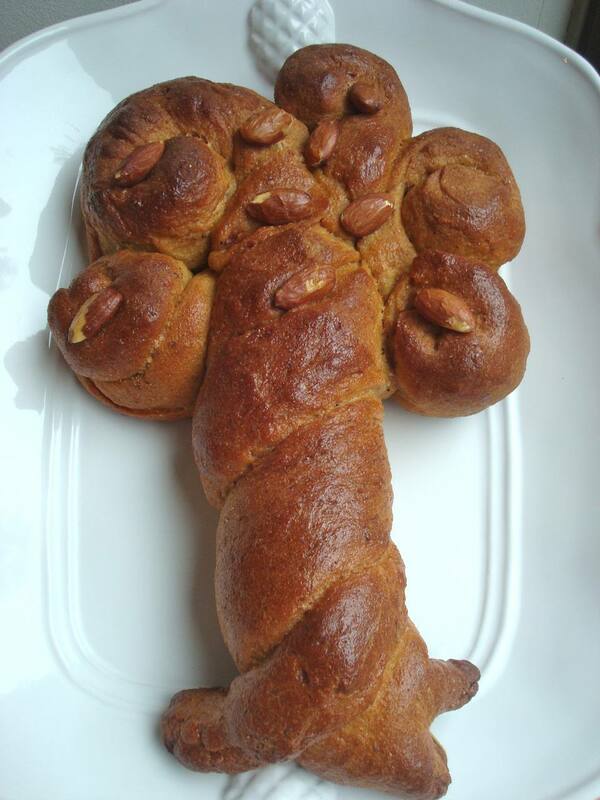 This tree shaped challah was inspired by Tu B'Shevat, the Jewish New Year of the Trees. But it would also be lovely for life cycle events that celebrate an addition to the family tree, such as a baby naming, bris, engagement party, or post-Aufruf or Shabbat Chatan luncheon. Read on for photo-illustrated step-by-step instructions for making a tree-shaped challah. Tip: If you're making dough from your own large-quantity recipe in order to do hafrashat challah, consider how much dough you typically use for a large braided loaf; that should be enough to make one tree challah. (This will be about 1/5 to 1/6 of the dough made with a 5-lb bag of flour). Next, take one of the large dough balls and divide it in half. These are the pieces you'll use to form the trunk of the tree in the next steps. Line a large rimmed baking sheet with a silicone liner or parchment paper. Take one of the smaller dough balls you just created, and shape it into a long rope. Lay the rope on the baking sheet. Repeat with the second of the smaller dough balls, making another rope of the same length and diameter. Lay the second rope next to the first. At the bottom of the twist, arrange the dough to resemble tree roots. You can simply spread out the bottom of the twist in opposite directions. Or, for more detail, cut into one or both of the pieces of dough, and shape into roots. Take the remaining large piece of dough from Step 1 and divide it into 5 pieces of fairly equal size. You'll be using these to make the foliage of the tree. Roll and stretch each of the dough balls between your hands to form ropes. Take one of the ropes and curl it around itself to form a spiral. Leave a small tail at the end of each spiral -- you'll use these to attach the spirals to the tree trunk. Arrange the Dough Spirals to Create the Tree's Foliage. Arrange the dough spirals side-by-side around the top of the tree trunk. Lay the tails of each spiral over or under the trunk to secure them to the challah. For visual interest, alternate the direction of some of the spirals. Cover the challah with a clean tea towel and allow to rise according to recipe directions. Preheat the oven as directed, brush with an egg wash, and bake. Transfer the challah to a rack to cool. Enjoy!